Made using Winsor & Newton's unique brush-making expertise, the Artists' Watercolour brush is tailored towards the needs of experienced watercolour artists'. The finest raw materials are used in the making of the brush, so there are no comprimises made when it comes to quality. Birchwood handles, Kolinsky sable hair and seamless nickle ferrules are all crafted together by hand to create an excellent watercolour brush. Useage Watercolour Soft Natural Hair with excellent flow control and colour carrying. The sizes and shapes within the range have been chosen in response to the demands of seasoned watercolour artists. Using their years of brush making experience, Winsor & Newton have improved the profile of the round brush to ensure excellent colour carrying capacity within the belly and the ability to keep a point. The newer shape, the 'Pointed Round' is brilliant for when extra fine detail and optimum colour carrying is essential. 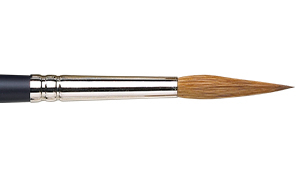 The matt birchwood handles of the brush are gently sculpted to form shallow undulations; these curves means that you are kept in perfect comfort whilst painting as the paintbrush rests in your hand. Used for fine detail, lines and washes. Round with an elongated point and tip for accuracy and fine detail. An adaptation of the traditional round; extra fine tapered point for extra fine detail work, and a large belly to hold colour. Extra fine point for lines, long scroll work and detail. The longest and thinnest watercolour brush. A short flat watercolour brush for edges and applying washes. Originally for the 'One-Stroke' application by sign writers. Available in sizes: 1/8", 1/4", 3/8", 1/2", 3/4", 1"
Sourced from Eastern Siberia, the Kolinsky hair used in the Artists' Watercolour brush is specially selected from the finest available. The hair has many natural properties which contribute to its excellent performance in watercolour brushes. Each hair filament is made up of a series of small, interlocking scales; these scales are capable of carrying a vast amount of colour. The large colour carrying capacity means that large areas can be covered without reloading the brush, and the colour will be released in a controlled manner. The natural profile of Kolinsky sable hair provides a pronounced belly and is tapered at the tip. The individual filments are expertly blended together which accentuates the natural shape of the hair. This gives the brush a large belly and perfect point. Kolinsky Sable hair is structured in such a way that its natural tendency is to spring back on itself. This tendency to spring back means that the brush shape is naturally maintained during painting, allowing the artist more control over their work. Kolinsky Sable is an extremely resilient hair. In the wild it protects the animal from the severe weather conditions in its native Eastern Siberia. This makes the hair very durable. A brush made from Kolinsky hair, if cared for correctly, will outlast inferior sables and synthetic brushes. The handle is made from FSC certified Birchwood. This certification ensures that the wood is sourced from a sustainable source and ongoing support is given to the growth of responsible forest management. The brush handle is sculpted into aprofile that features two bellies. The central dip between the two bellies allows the brush to rest comfortably in the users hand and combines very well with the comfort of the matt finish. 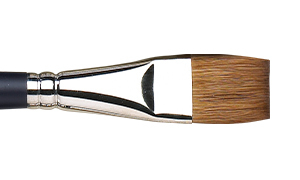 The second belly towards the end of the brush allows for the handle to be held securely in different painting positions. This feature is particularly useful with larger scale brushes as it allows for more loose marks and covers a larger area of paper. 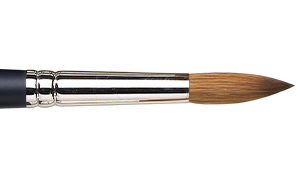 Unlike the majority of artists' brushes, the Artists' Watercolour Brush features a matt finish. This matt finish allows for a more secure grip and also helps differentiate the brush between those with a gloss finish, meaning it is easier for you to find them in amongst your collection! 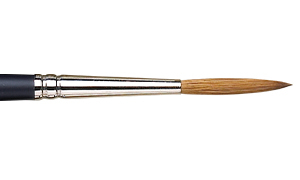 A seamless nickel ferrule attaches the brush head to the handle. This prevents the corrosion of the ferrule and the handle when in contact with water. With over 150 years worth of experience, the brush makers at Winsor & Newton have applied their knowledge in order to produce brushes of the highest standard. All brushes in the range are hand crafted at the Winsor & Newton brush factory. Hair is then placed into a 'cannon' and gently tapped to allow the hairs to align for the brush maker. A linen thread is used to carefully tie the tuft together. Then expertly shaped in the hand of the brush maker. The tie is tightened to maintain the perfect shape. As is always the case with brushes, it is paramount that they are cared for and cleaned correctly. We do have a handy page with cleaning and care instructions for watercolour brushes if you have any questions. Following these cleaning proceedures will extend your brushes useable life!